Oxycodone is a highly addictive opioid medication with significant abuse potential. Withdrawal from oxycodone is not life-threatening, but it can be dangerous without medical supervision. Withdrawal usually begins between 8 to 12 hours after discontinuation, and symptoms usually diminish within 7 to 10 days. Several facts can affect withdrawal, including how long the drug was used, how much of the drug was used and individual differences in physiology. Opioid substances exert their effects via an interaction at a certain site in the nervous system – termed an opioid receptor. These receptors are present throughout the body. This helps to explain why withdrawal from opioid drugs such as OxyContin often produces such a widespread range of effects when compared to a relatively limited array of withdrawal symptoms from drugs that primarily affect neurotransmitters such as dopamine. Dysphoric mood (general unease or dissatisfaction with life). Runny nose or teary eyes. Sweating or goose bumps on the skin. Withdrawal from opioid drugs such as oxycodone is unpleasant. But it is typically not considered a medical emergency. However, some people may suffer severe psychological distress and be prone to self-harm. Users are at a very high risk for relapse in the early stages of withdrawal because taking the drug will result in a very quick reversal of withdrawal symptoms. Prolonged use of opioid medications, such as oxycodone, results in changes in the neurons in the brain and other nerves and tissues in the rest of the body. As the person continues using oxycodone, the body learns to maintain its state of balance, or homeostasis, only in the presence of the drug. When someone who has chronically abused narcotic medications such as oxycodone suddenly stops using the drug – or abruptly and significantly cuts the dosage – the levels of the drug in his or her system rapidly declines. The new state of homeostasis is disrupted, resulting in a number of physical and mental withdrawal symptoms. Individual differences in both psychological and physical make-up. No two people are alike, and different people react to the withdrawal process in different ways. The mode of administration of the drug.Tolerance to the drug is developed more quickly if it is administered in a way that results in the drug entering the system quickly. For example, people who inject opioids, or grind them up and snort them, will typically experience more severe withdrawal symptoms than people who take the drug in pill form. The length of usage. The longer someone has used the drug, the longer his or her withdrawal period will typically be, and the symptoms will be more severe. How much the person typically used. Those who take larger amounts, or higher doses of the drug, tend to experience longer and more severe periods of withdrawal symptoms. How the person stopped using the drug. Quitting oxycodone abruptly will produce more severe withdrawal symptoms than tapering down the dosage over a period of time. When a person makes the commitment to go through an assisted detoxification process, he or she will need to decide whether to use an outpatient or inpatient approach. Advantages to the inpatient approach include around-the-clock supervision, where emergencies can be immediately addressed. Outpatient detoxification programs are best suited for people with very mild oxycodone use disorders. Length of time the drug was used. The amount of the drug that was used. Any other relevant information on your history of oxycodone use/abuse. Getting acclimated. 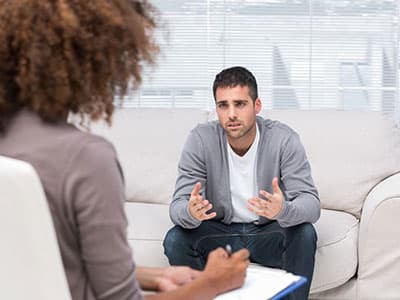 The therapist then devises a treatment plan, after which you and your therapist usually tour the facility so you know where everything is located. You are then assigned a room and a counselor, or other supervisor, who will help you unpack and ensure there are no prohibited items among your belongings. Most residential treatment programs prohibit any medications, substances containing alcohol, and any electronic items, such as cell phones. Medical examination. New clients also receive a complete physical to check for any communicable diseases and issues related to addiction, which helps with treatment planning. People in residential programs usually stay in rooms with other recovering addicts, but some facilities offer luxury suites with private rooms. Medication. Many treatment programs include medications to assist in the detoxification process and to address other withdrawal symptoms. Using these medications requires the supervision of a qualified physician. Detox will most likely begin with an oxycodone taper, regardless of whether you choose an inpatient or outpatient approach. This tapering process is designed to help you slowly adjust to ever-decreasing dosages of the medication and to minimize severe withdrawal symptoms. 8 to 12 hours after discontinuation. Symptoms of withdrawal generally begin during this time. People with severe tolerance, who have regularly taken high doses, may begin to experience withdrawal symptoms much sooner. 36 to 72 hours. The most intense withdrawal symptoms typically occur during this time. After 72 hours. Withdrawal symptoms begin to decrease in intensity. Between 7 to 10 days. The majority of withdrawal symptoms are typically resolved. Following detoxification, you will either be discharged or transferred to an inpatient or outpatient recovery program for substance abuse. Once you have gone through the detoxification process and after all traces of the drug have been effectively eliminated from your system, your level of tolerance may have decreased significantly. People who return to abusing oxycodone (or other potent opiate/opioid drugs) following detoxification place themselves at risk for serious overdose and even death due to this change in their tolerance for the drug. Buprenorphine, the primary ingredient, is a partial opioid agonist. It produces a mild euphoria and diminishes other withdrawal symptoms. Naloxone, the secondary ingredient, is an opioid antagonist or blocker. This medication prevents you from abusing Suboxone. Because buprenorphine is a partial opioid agonist, people taking Suboxone may develop a physical dependence on this drug. However, the tapering process and withdrawal symptoms involved in stopping the use of Suboxone are easier on the user. Clonidine (used to treat high blood pressure and sometimes used to manage addiction to certain opioid medications). Other analgesic medications (if you took oxycodone for pain control). Medications to assist with physical symptoms. Who Answers? . These representatives can help you find an oxycodone rehab center in your area and confirm your insurance coverage. Are designed for very short-term treatment. Assist you through the detoxification process and withdrawal symptoms. A person at a detox center is discharged when the detoxification process is complete. Some detoxification centers may offer educational programs and other therapies, but long-term recovery is not their goal. You are supervised 24 hours a day, so emergencies can be addressed immediately. You are removed from your drug-using environment. This is especially important if you live in an environment that fosters drug use. Treatment centers continue working with you after the detoxification process is complete. Inpatient treatment usually lasts between 30 days and 90 days but can be extended in special cases. You can prepare to cope with triggers in your environment as you receive a variety of therapies ranging from group to individual therapy. You receive continued medical management as needed. Support groups such as 12-step programs allow structured recovery opportunities and long-term social support. Family education and family therapy assist in family issues related to your substance use disorder. A long-term aftercare program can be developed when you are ready to leave. Inpatient programs are useful for those with severe substance use disorders, such as addiction to oxycodone. Most people with serious substance abuse issues will require an ongoing aftercare program. Many people remain in long-term support programs, such as 12-step groups, for much longer than a prescribed program plan, and in many cases, decades. Outpatient treatment can consist of many of the same components described above, but it is extended over a longer period of time. Detoxification does not address the issue that drove the person to addiction. Many people try to detox from oxycodone at home, and a number of websites have offered information that attempts to assist people coping with withdrawal symptoms. Books and other sources maintain that vitamins or natural foods can aid in detoxification from opioid drugs like oxycodone. On its own, detoxification does not get to the heart of the issue that initially drove the person to addiction. For this reason, it is extremely important to have a professional recovery plan in place. The oxycodone detoxification process is typically completed within 7 to 10 days. People with relatively strong constitutions may be able to weather the symptoms without medical management. However, many also relapse due to the unpleasantness of these symptoms. Some people may become suicidal during withdrawal. These people have the potential to self-harm. Going through unsupervised detox does not offer an opportunity to address medical emergencies. Delete all contact numbers of people associated with your drug use, including dealers who were sources of drugs, or friends or acquaintances you primarily did drugs with. Identify close friends or family members who are committed to your recovery; inform them of your decision to stop using. Get in touch with a support group immediately after you return from detox or treatment and promptly attend a meeting. Get rid of all drug paraphernalia, alcohol and unessential medications. Create a list of positive things to do to maintain abstinence from oxycodone. People who attend structured recovery programs have a better chance of maintaining their recovery following detoxification. You should strongly consider finding an inpatient or outpatient oxycodone rehabilitation center upon completing detox or choose a recovery program that incorporates detox into the program. Attending long-term aftercare treatment, such as individual counseling, group therapy, or social support groups will increase the likelihood of long-term success following a recovery program. Eating a balanced and healthy diet. Is Rapid Oxycodone Detox Safe? Rapid detox refers to a procedure where you are admitted to an intensive care unit and are administered a general anesthetic. While under anesthesia, you receive drugs to block the opioid receptors in the brain, followed by other medications for nausea as well as muscle relaxers. What’s more, rapid detox is typically performed in an intensive care unit, so it may be far too expensive for most people. Because the program does not address long-term recovery from addiction, it is generally not recommended. Getting detox treatment is an important first toward recovery, and we can help you find an oxycodone detox program. Call our helpline at 1-888-319-2606 Who Answers? to verify insurance coverage anytime. If you don’t have insurance, call the Substance Abuse and Mental Health Services Administration’s (SAMHSA) national helpline at 1-888-319-2606 Who Answers? for a referral.
. Ries, R. K., Fiellin, D. A., Miller, S. C., & Saitz, R. (2014). The ASAM principles of addiction medicine. New York: Lippincott Williams & Wilkins.
. Centers for Disease Control and Prevention (CDC). (2011). Vital Signs: Overdoses of Prescription Opioid Pain Relievers – United States, 1999-2008. 60(43): 1487-1492.
. American Psychiatric Association. (2013). Diagnostic and statistical manual of mental disorders -fifth edition. Washington, DC: Author.
. Centers for Disease Control and Prevention. (2013). Deaths and severe adverse events associated with anesthesia-assisted rapid opioid detoxification – New York City, 2012. Morbidity and Mortality Weekly Report 62(38):777-780.